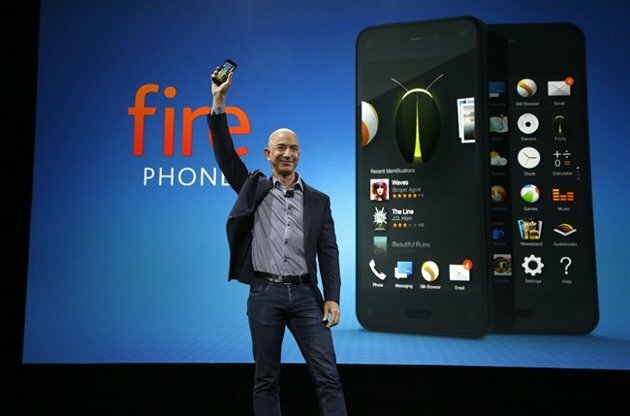 More than seven years after Apple introduced the iPhone, Amazon unveiled the Fire Phone, its first foray into the smartphone market Wednesday at an event in Seattle hosted by Amazon CEO Jeff Bezos. Bezos pulled the phone out his pocket before a crowd of 300 gathered near Seattle. The $200 Fire Phone is equipped with a 3D-capable screen and an ability to recognize music and TV shows. It has 4.7-inch HD display, a quad-core 2.2GHz processor and 2GB RAM. The phone will be available on July 25 through its exclusive carrier, AT&T. Without a contract, it’s available for $649.